Thwarted by two false starts, the first for storms, the second for rail strikes, it was finally chocks away as the Islander lifted off like a Mountain Banshee from Land’s End airport. Within 15 minutes, it deposited its eight passengers on St Mary’s in the Scilly Isles. Quarter of an hour later, I was standing in England’s most southerly vineyard, glass of Holy Vale Pinot Noir Rosé in hand. Robert Francis, vine grower, winemaker, lobster fisherman and owner of the Star Castle Hotel, was taking a small, attentive group of wine tasters through his Scillonian wines. 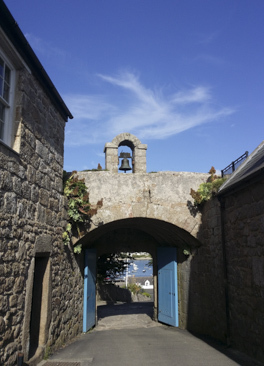 If “Scillonian” sounds as Greek to you as it did to me, St Mary’s, with its azure coastline, neighbouring islands and active fishing harbour, does have something of the Cyclades about it. 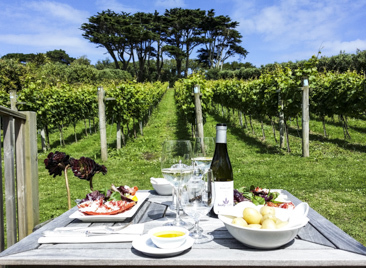 Yet, Scillonian is in fact the name for all things Scilly, including the island’s wine, explained Robert, welcoming us to the pretty vineyard and converted barn winery which was officially opened by Christie’s legendary auctioneer and wine writer, Michael Broadbent MW last year. That glass of refreshing rosé came from some of the 7,000 vines he planted in a variety of spots on the tiny island in the spring of 2009. 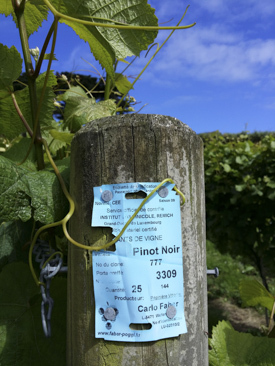 “I had to beg, steal and borrow enough parcels (of land) with suitable south-facing slopes, good drainage and in sheltered spots,” he said, explaining that his vineyards were planted roughly two-thirds pinot noir grapes, a third chardonnay and the rest pinot gris. Holy Vale is one of several parcels of vineyard planted by Robert, who walks us round a sea of green: green vines, green bunches, the lawn-like grass on which the vines stand to attention. It’s a pretty vineyard, bordered by high hedges and trees that shelter the vines from the excesses of the island’s blustery weather. Two years ago, Robert thought he had his reward in the Scillies’ first ever wine crop but thrushes, starlings and sparrows had different ideas and he ended up with just 40 litres. Last year was his first full harvest, which was bottled this May under the watchful eye of Austrian sweet wine maestro Willi Opitz, from whom Robert had been buying wines for the hotel list. ‘When I told him I had planted a vineyard, he offered to come and help make and bottle the wine’. In a good year like 2014, the Scillies’ maritime climate and intense luminosity combine in a powerful force for ripening. I realised this to my cost after a crossing filled with entertaining shipwreck yarns from Tim the boatman to the tiny neighbouring island of St Agnes. On returning to St Mary’s, I looked in the mirror and saw a vine-ripened tomato staring back at me. On St.Agnes, I hiked past quaint cottages, farm shops, lighthouse and rocky island coves. I made a pit stop for lunch at The Turk’s Head pub, whose cosy interior is trumped on a sunny day by a split-level terrace overlooking Gugh, to which it is joined by a sand bar. With its dramatic views of the ocean, St.Agnes is a walker’s paradise whose rocky, wildflower and heather-clad terrain is splashed with colour. Everyone is so friendly that you end up having to re-arrange the fixed grin that gets stuck to your face. A fine summer last year resulted in a respectable total of 2,490 litres of wine, roughly half of which went into the Classic Pinot Noir, the rest split between the Chardonnay, Pinot Noir Reserve, Pinot Noir Rosé and Pinot Gris. While Robert is justifiably proud of the results, this summer’s changeable weather has so far produced grapes only the size of petits pois. ‘I could always make sparkling wine’, he says, glass half full. ‘We do well with fizz in the UK as we struggle to ripen the grapes but you don’t need the same level of ripeness as you do for still wines’. Since English fizz has made such a splash, why make still and not sparkling wine then? ‘The point is that it’s still wines that I mostly enjoy and understand and as long as the project washes its face and isn’t a drain on the hotel’s resources, then I’m happy with that. Besides, there’s not a lot of good English still wine compared to sparkling’. Hotels run in the Francis family blood. Robert was born in one in Mullion on The Lizard in Cornwall in 1953. His grandmother brought his father up in a hotel in Newquay. His love of wine dates from the early 1970s when one evening, a couple in the hotel restaurant in Mullion told him they were enjoying the most wonderful Châteauneuf-du-Pape. Asked to join them in a glass, the man presented him with a 600-page tome on The Wines of the Rhône. It was the Rhône expert, Jonathan Livingstone-Learmonth and his wife Fiona. A lifelong friendship, and passion for wine, ensued. After falling in love with the Scilly Isles, Robert built a hotel on the island of St.Martin’s during the Thatcher era, but when his bank went bust, he lost both business and home. In 2001, he gratefully seized on an offer by the owner of the Star Castle, Mary Nicholls, to run, and eventually buy, the hotel. Six years later, he decided to plant a vineyard. ‘I imagined it as having my own market garden, only the garden would be the vineyard and the market the hotel wine list’. In the summer of 2011, as a Duchy tenant, Robert was invited to Highgrove, and as soon as Prince Charles got wind of the fact that Robert had planted a vineyard on Duchy land, Charles insisted on having the first bottle. He was occupied with other duties on the island when he and Camilla went to St Mary’s this summer, but, as patron of the UK Vineyards Association, Camilla paid a visit to the vineyard on 21st July and Robert conducted a tasting of the wines. The Duchess was duly presented by the Francis grandchildren, Sophie, Thomas and William, with a special box containing the five wines produced this year along with a special sixth bottle, of Schilfwein. Only 12 half-litre bottles of this Austrian-style sweet wine were made, the product of grapes from the 100-year-old vine adorning the ceiling of the conservatory and dried in the traditional way on reed mats in polytunnels at Silver Carn on St. Mary's. The Star Castle couldn’t fit the wine tourism bill better. Robert has first pick of the fresh John Dory, cod, hake, squid, brill, Dover sole and turbot brought in by the trawler, Sowenna. 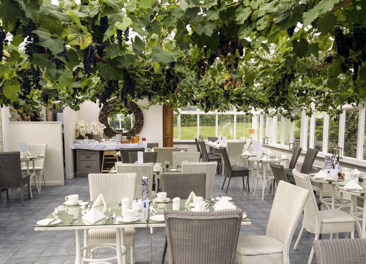 In addition, his own lobster catch and island-reared Salakee duck are on the menu of both the Castle and Conservatory restaurants, along with an eclectic wine list featuring, among others, Holy Vale wines. As an integral part of the thick-walled castle itself, The Castle Dining Room is snug and warm. In contrast, the vine-clad Conservatory is light, airy and more informal with a view of the gardens during the day. The food in both is ocean-fresh, impeccably cooked, presented and served, especially the fish, lobster and duck, while the young friendly staff are trained to a high professional standard. Standing on the Garrison Hill above Hugh Town, the Star Castle, fortified with hexagonal walls (hence the “star”), was built in 1593 for the defence of the Scilly Isles during Queen Elizabeth I’s reign, and opened as a hotel in 1933. In addition to the castle’s elegantly refurbished rooms, the spacious garden rooms look out over their timbered terraces onto four acres of gardens and a panorama of islands. Tasting the full range back at the Holy Vale vineyard, the biggest surprise was the Pinot Gris, with its fresh pear fruitiness and appley dry bite. I could see that going down a treat with lobster. On cue, a sweet-fleshed lobster made its appearance at lunch in the vineyard next day, accompanied by the 2014 Holy Vale Pinot Gris. 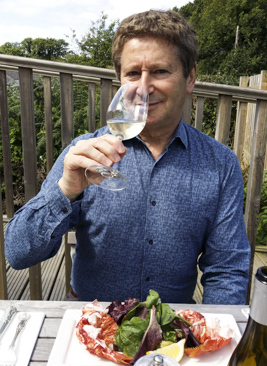 It was a more mouthwatering Scillonian food and wine match than I could ever have imagined before embarking on a trip to the place between land’s end and deep blue sea. Skybus fly to St Mary’s from Newquay, Exeter and Land’s End and the Scillonian ferry departs daily from Penzance, all bookable with Isles of Scilly Travel (www.islesofscilly-travel.co.uk. Telephone: +44 (0) 1736 334220. Email: sales@islesofscilly-travel.co.uk). First Great Western Trains operate regular daily departures from London to Penzance (firstgreatwestern.co.uk). The Star Castle Hotel (www.star-castle.co.uk; 01720 422317) has double rooms from £102 per person per night, based on two sharing on half board basis. Wine tastings at the Star Castle’s Holy Vale Vineyard cost £17.50 per person, including five wines and complementing tapas. Lobster lunch and a glass of Holy Vale wine will cost £24.50.